Yesterday was the announcement of the winners of the very first Philippine National Children's Book Awards (NCBA). The awards are for the very best children's and young adult books published in the Philippines (2008-2009). There are no categories and no rankings for the NCBA. And the NCBA does not only evaluate the text of the nominated books. Illustrations, book design, and even the materials used in printing and binding the books are evaluated when choosing the "best reads" for young people in the Philippines! I was a judge for the awards (yes, this is me revealing my sooper sekrit project!) and I am very proud to now share with you the six winners of the first NCBA. Below are the winners' covers and the judges' comments on the books. "Listen well," her mother tells her. "Hold on to me tightly, ha? So you won't get lost. And don't point at things that you want me to buy for you." And so the story begins with a promise: "Yes, Nanay, I promise." Early one morning, a little girl accompanies her mother to the market. They take readers with them. The market is hot and noisy, smelly and muddy, but it's also fascinating and colorful, because it's seen from a point of view that's only about three feet tall. When they arrive home, and our little girl unpacks the bayong (bag) to find a surprise wrapped in newspaper at the bottom, it's her joy we feel in the little dance that she does. Araw sa Palengke is a true marriage of text and visual image. The story by May Tobias-Papa is gentle and straightforward, and the illustrations by Isabel Roxas are charming and finely detailed. The result is a lighthearted picture book that is nuanced, controlled, and thoroughly engaging. A really good read. One interesting concern that was raised among the judges was that appropriate reading for ages 9-12 was sadly lacking in the market. Here then is a book that is both educational and entertaining for kids at the threshold of adolescence - kids ready for meaty facts, yet still profiting from the visual and often humorous support of illustrations. The title of the book, Can We Live on Mars?, aptly echoes children's questions about astronomy and its function in culture and society. This book is serious fun. Written, illustrated, and designed as a handy collection of facts and activities about the study of space, Can We Live on Mars? provides concise and enjoyable reading and should be a useful supplement to science textbooks in schools today. Gidget Roceles-Jimenez’s writing effectively converses with young readers, while the illustrations provided by Bru ensure the liveliness of this exchange. Finally, the challenge of keeping these elements integrated and organized was met by book designer Lesley Lim. By locating the Philippines in the constellation of achievements in the history of astronomy, Can We Live on Mars? boosts our sense of identity and creativity. It is an empowering and inspiring book, giving students sound ideas on what they can do as budding scientists and responsible global citizens now and into the future. One morning, Miguel wakes up to find little mung bean seedlings growing out of his ears. "That's what you get for not taking a bath," his mother says quite nonchalantly. Miguel promises to take a bath, but he keeps putting it off so that he can play with his friends. Meanwhile, more and more plants start growing all over his body - a veritable vegetable garden! Miguel starts to panic, but his mother remains cool and calm. Dr. Fe del Mundo's devotion to her profession is clearly yet dispassionately rendered from the point of view of an observer who is a child. Details of her achievements are unfolded in natural settings - the hallway of her office documenting her career in photographs or a dinnertime conversation between the child and her parents - and not simply a dry copy of the pediatrician's curriculum vitae. The book's uplifting theme is shown without sounding preachy and pedantic. The title suggests the sound of a beating heart, a gift shared by everyone; thus gently disputing the child's original claim that her younger sister is "different." As the title suggests, these backyard creatures are not always obvious. They are surprising finds when one cares to seek them out. Mr. Tejido utilizes a full range of earth colors and jewel tones while carefully integrating texture into his illustrations. The creatures are in their proper habitats, but their surroundings never overwhelm them. Each creature is carefully drawn, well defined, and well proportioned. The proboscises of the butterflies, the segments of the earthworms, the thorny hind legs of the grasshoppers, and the joints of the spiders’ legs are a few examples of the exact anatomical details in a book that is both artistic and accurate. Mr. Tejido's decision to start at ten and count backwards adds a refreshing perspective to this book. Rote counting backwards is a necessary skill and it is never too early to introduce that skill to children. The child in this story anticipates every Saturday, as it is the only day he can be with his father. We are caught up in the excitement of the child. And why not? The father is an amazing man! He always has something new in store for his son. He entertains, he cooks, he teaches, he steels his son for the future. It is easy to be drawn into the child’s narrative. We wish with him that Saturdays would come more quickly than every seven days. One is then taken aback by the surprise revealed at the end of the book. The carefully omitted background details and the characters' clown-like faces in the illustrations succeed in showing the intimacy and wonder between the child and his father and in keeping the secret until the very end. I'd like to take this opportunity to thank the organizers of the NCBA: the members of the Philippine National Book Development Board (NBDB) and the members of the Philippine Board on Books for Young People (PBBY). The members of the NBDB and the PBBY are so hardworking, so professional, and so friendly. They are awesomecakes topped with awesomesauce. I would most especially like to thank the other judges: Dr. Lina Diaz de Rivera, Karen Flores, Ana Maria Rodriguez, and Maria Elena Locsin. I learned so much from all of you. And discussing children's and young adult books with you felt like coming home. Yay, you've been so excited for this event and I'm glad you finally got to announce the winners so you could share the news! I have to take note of these books so I can check them out. Yes, please do check them out, Chachic! Can We Live on Mars? is EXCELLENT. I hope your son liked it! So cool! And they all look so good. SQUEE! They were lucky to have you. Now I understand the big secreeeecy. :D What a thrill and honor, Tarie!!! Thanks for sharinf these gems with us. I love what I see on the covers. wow! 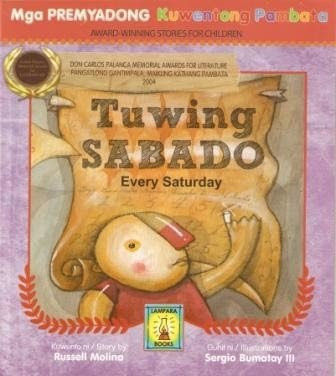 Tuwing Sabado is my personal favorite. 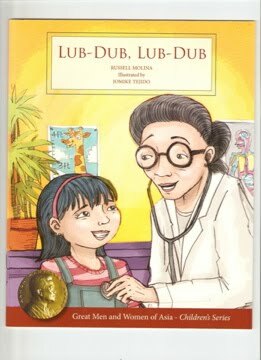 I love reading this book to my pupils. A very moving story indeed. The books all look great. Available in the US? Must have been fun, being able to help judge this. Thanks, everyone! It was indeed a great privilege and honor to be one of the judges. And yes, I had a lot of fun! I HAVE TO organise a trip to the Philippines so I can buy all these books. Can't wait! But, are they available online as well?